I got this yesterday from a guy who happens to be on this forum. A custom 1977 with Stereo Vibe. Mr. Garfield had swapped in a 1976 keybed, implanted 1978 bump mod action and did some tine changing. It truly is a custom model. After a little re-positioning of the keybed, she now plays beautifully! Looks like it has an active pre-amp in it as well? Battery powered? Hey guys! Brand new to the forum. I just picked up my first Rhodes after lusting for one for years. The time was right and it seems like it was just meant to be. 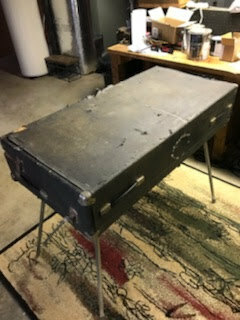 She's a Mark 1 Suitcase piano. I got it without the suitcase amp or legs, so just the piano. 250 dollars. Believe it or not, lol. It's in fantastic shape considering the price, all the tines sound (except for the very first key which is missing its tine altogether. Probably the best tine that could be missing if any) and incredibly it was still in great tune. Story goes that last Friday I was scouring the list of Craig (as I do on a daily basis). I always set the location settings as "show other locations" and I'll check literally every city in Texas. 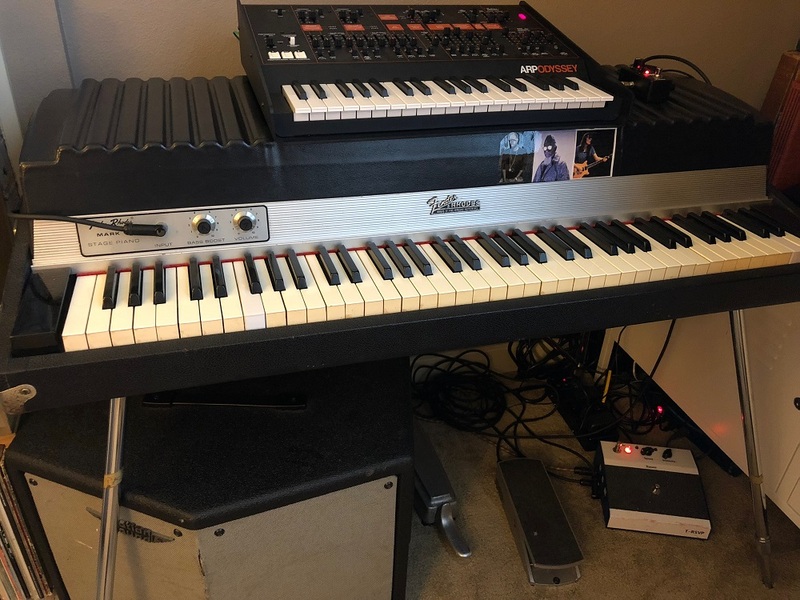 I found a listing for a Rhodes piano in Dallas (I live in San Marcos, a good ways from Dallas) at the aforementioned price and I called him to find out what was wrong with it. 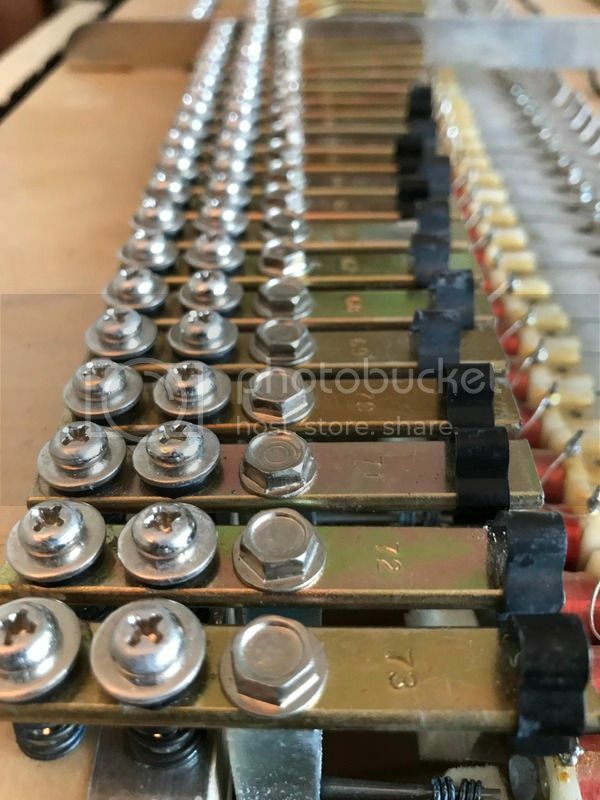 He proceeded to tell me that keys 11-24 don't sound, but he had never plugged it in as he has gotten the piano for free from one of his regular customers (he works in electronics and tubes) without the amp or legs. I told him I'd drive to Dallas that night right after work (7 hours in the car total). He told me that someone 20 miles from him had reached out to him first, but "couldn't find the time to come down that day, so I'll just check it out tomorrow". 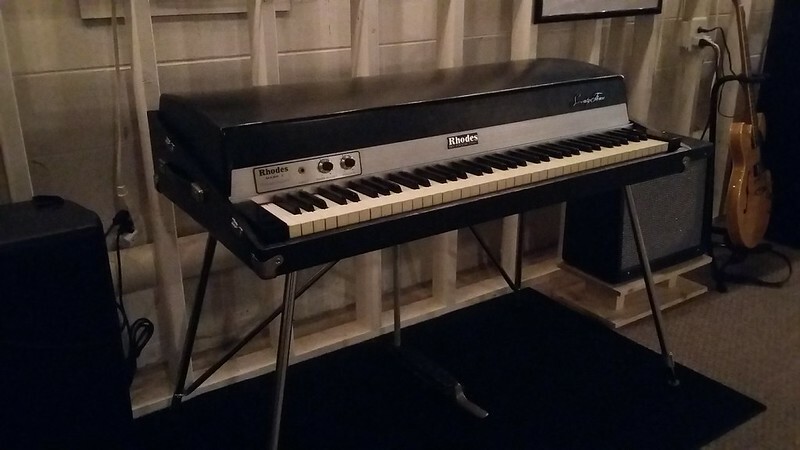 The seller had told me that he couldn't understand how someone couldn't make time to drive 20 miles to see an incredibly priced vintage Rhodes, so when I called and told him I'd be driving clear across Texas he didn't hesitate and told me it was mine if I showed up with the cash that night. Guy who sold it to me actually used to play keys with Chuck Rainey back in the day. He was telling me how his main setup revolved around a MKI 88 that he used to own. I noticed that his hand was basically mangled, I think that he must have just had surgery on it or something, but the clearly he wasn't playing anymore. I think this has to do with why he got rid of it at such a low price (on top of the "issues" he thought that it had. More on that in a second). We sat and talked a bit about the experience of schlepping around vintage analog gear and how it's totally worth it for that unmatched tone and timbre. Great guy, and hope to hear from him in the future. I did find, however, on plugging it in that keys 44-73 had extremely low output, almost no sound whatsoever. Also a very intense and constant buzz from the piano. Spent a few hours poking around under the hood and found that there was a tiny break in the pickup wiring between keys 47 and 48. The piano almost sounded brand new. I'm sure more veteran ears could point out certain things in the piano that could be worked on, but to me it is effin' pristine. Anyway, super happy to be here guys. 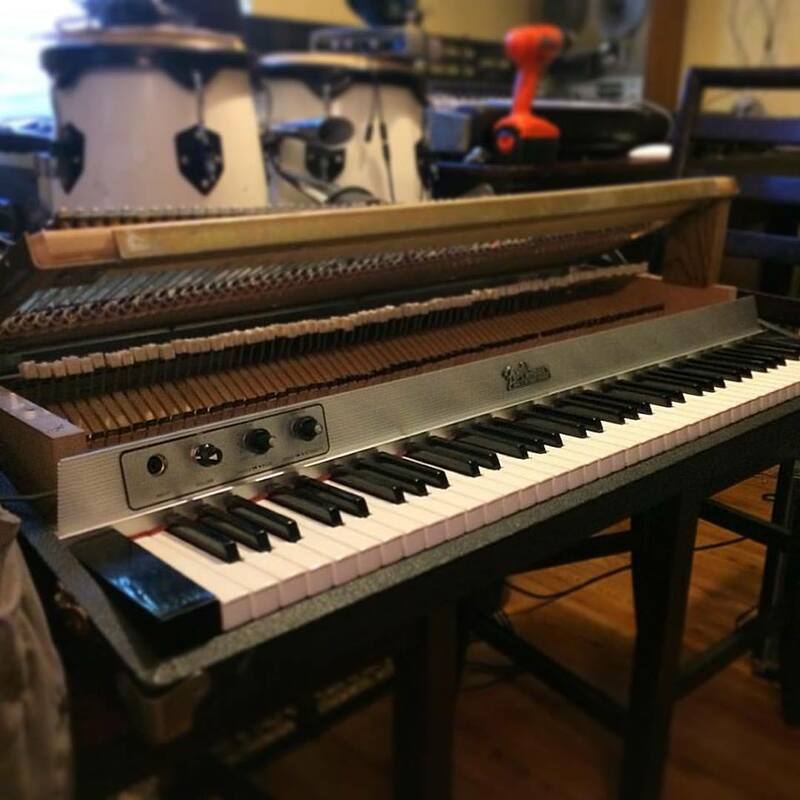 I love my new/old Rhodes and am very excited to be a part of this community! Welcome to the forum Patrick! That sounds like a score! Thanks! There's an incredible amount of info on this forum, very happy to be here. 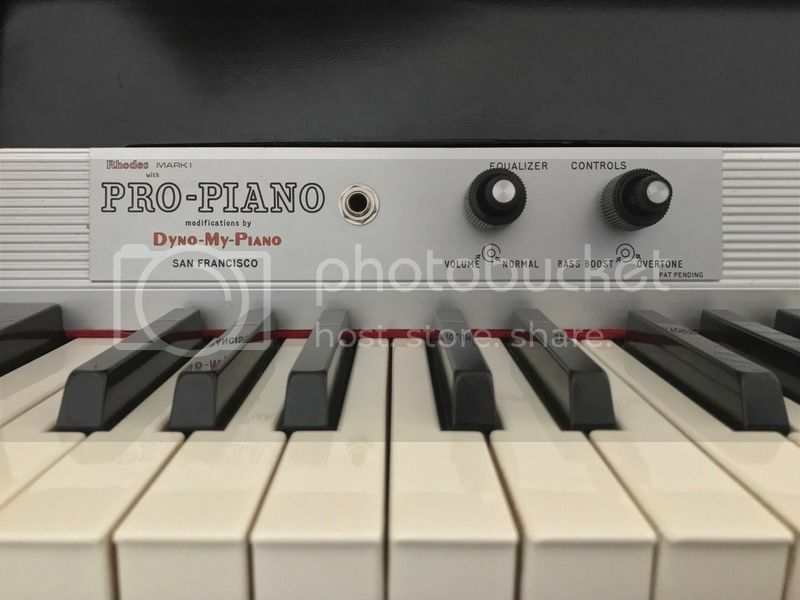 I've updated my post with working pics of the piano btw. You're welcome. Based on the logo and the pre-amp, it's an early '70s suitcase top? Yes! 50th week of 1970 if I'm reading the date code correctly. Alright! Have fun with it!!! 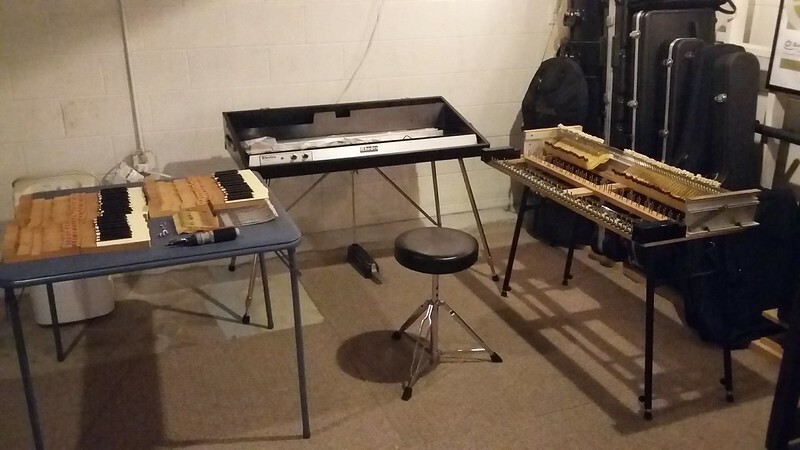 Im new to this forum as i wish someone could help me out with my piano! My Dad had passed away 5yrs ago and i had unearthed his piano when my Mom and sis moved out from their old house.. i had used this piano when i was a kid and seeing it again after 28yrs does melt my heart! I believed it is a 79 model seventy three suitecase and the condition is not so good due to its being stored since the last time i touched it! I wanna restore it back to its glory however, its a daunting task given that i lived in Hong Kong and nobody here seemed to know this piano at all! For me, this piece is a classic and the value is much more than i expected coz it belongs to my Dad who had taken care and loved his instruments! I hope someone closeby could help me restore it perhaps give me some tips or advise! Do you have the cable that goes from the side panel of the bottom amp to the preamp on the name rail? Take a little time cleaning it out, and you will see that it should be easy to get the piano working again. 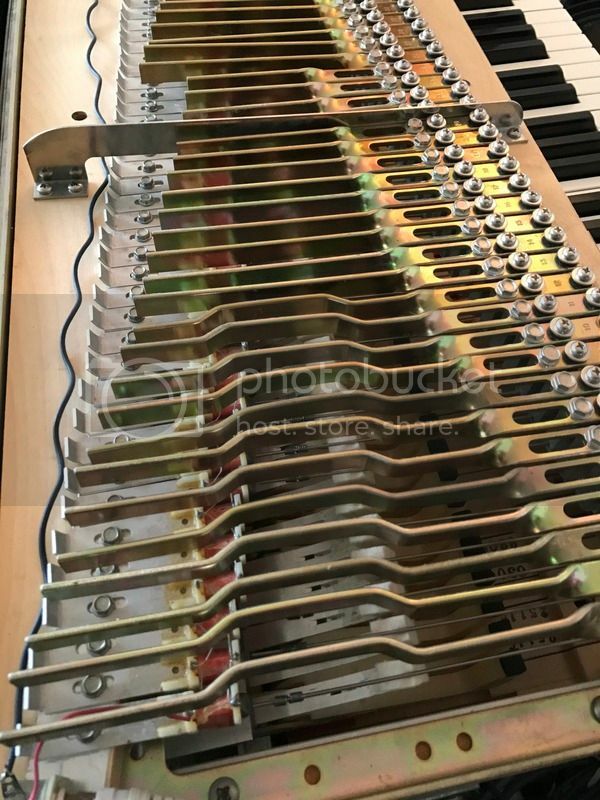 The keys look like they need leveling, but that may be just felts or paper punchings (paper spacer rings) not sitting down correctly, or random junk in there. If you take the namerail off (two screws on either end), you can carefully lift out the keys and see what is going on with the felts and paper punchings. Keep us updated with your progress, and every time you get stuck, just tell us the situation, and we will help you out. 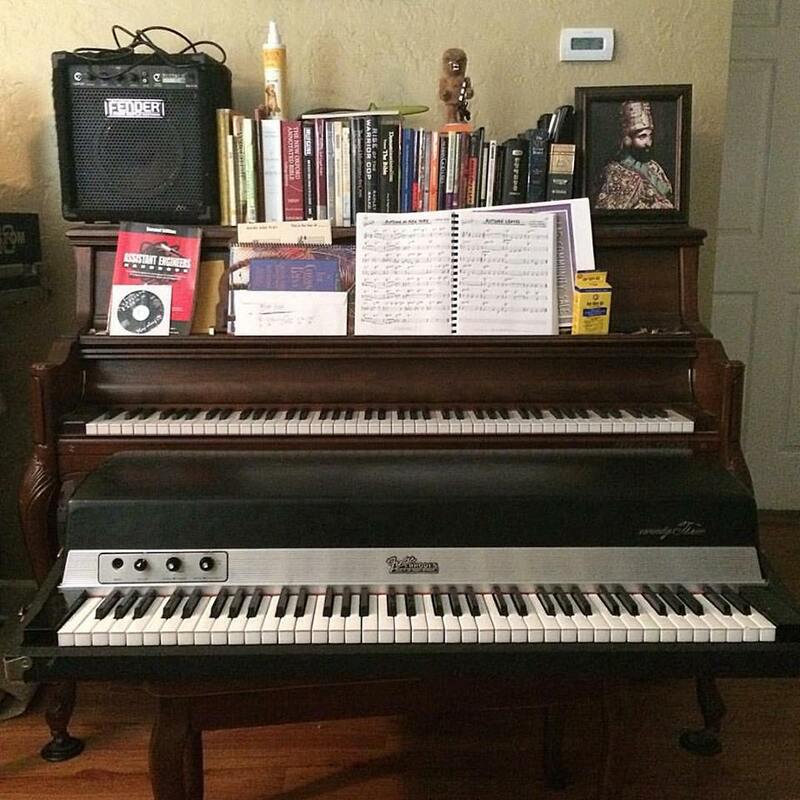 By the picture, it is a 1975 piano if all original. Do the keys get stuck down when you push them? Welcome to the forum Evan! Looks like you scored a pretty nice piano from the pic. Being a 77, you might have the felt on the hammers instead of the pedestals wich would only be somewhat of a concern if you decide to do a bump mod. Other than that, looks great! Look foward to seeing what you cook up on your new grill! Felts are definitely on the bottoms of the hammers as opposed to the pedestals. Why is this a concern? Not so much of a concern but the pianos responsiveness is often not as good as when the felt is on the pedestal. To improve the playability of the piano a "miracle mod" is often required whereby a small bump is added to the pedestal to help kick up the hammer. You can add the bump by itself on the pedestal (without any felt on top of it) and leave the felt on the hammer cam but sometimes the felt on the cam can lock against the bump if the felt wasn't installed properly by the factory. So if you find that the action isn't that great, most people would suggest to remove the felt from the bottom of the hammer cam. Do the miracle mod and add the felt on top of it on the pedestal. Sorry for the late response, things got busy. Tim put it very well. I didn't mean to make it so dramatic sounding. Just means you may have a little extra work involved if you decide to do the bump mod. It seems by all accounts that the bump mod is the right thing to do. I might as well get that VV restoration kit. There's some oddities on this piano that I'm sure aren't oddities at all, but because of my lack of experience I have trouble diagnosing. On a soft blow, everything E3 and above has an audible tone to it. Once the damper position changes, going down from Eb3 all the way to E1 have really spotty tone where sometimes I'm getting a really soft note, and other times it's not audible at all unless a hard blow. If I depress the pedal as I'm going down the bass, the notes sound good. 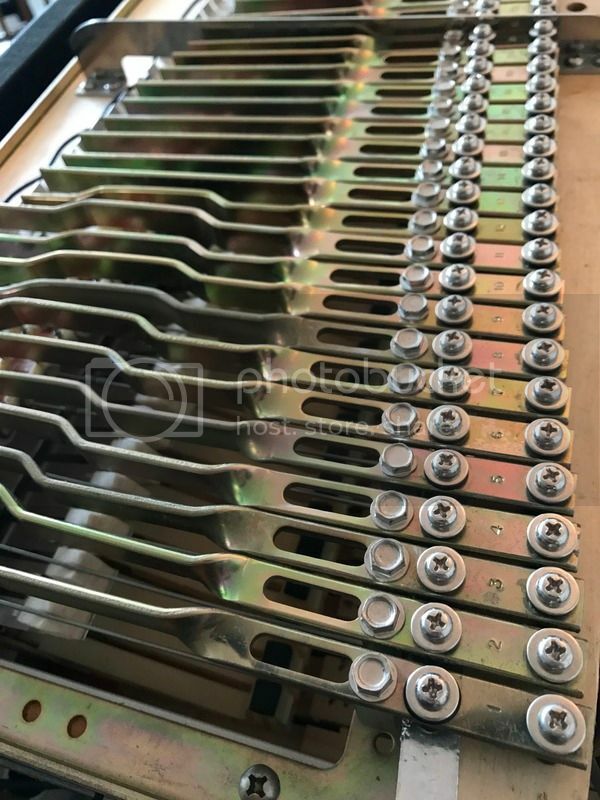 Aside from checking the lost motion in the dampers, what other issues could this be? 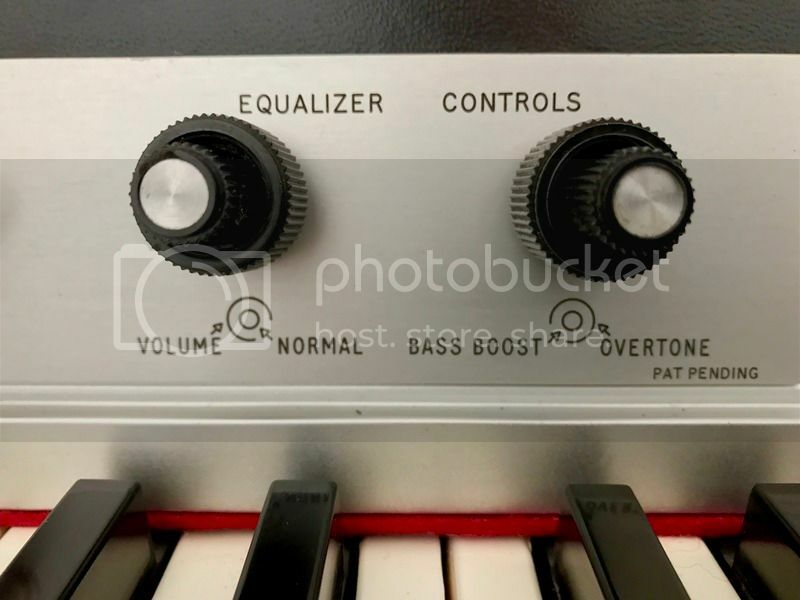 B4 and above have more action noise than the rest of the piano. Almost like a high pitch knock or a click. As I'm not too familiar with what the action noise should sound like, I'm wondering if this is even a valid concern. Either way, I'm planning on installing everything from the VV restoration kit and see where it goes from there. The hard hammer tips on the treble end of the piano make the collision between the tine and hammer tip exceptionally percussive. That is just the nature of a Rhodes. You will get used to it. Take a look at the Service Manual, and work on your escapement, pickup positioning, and timbre adjustment (voicing). Thank you! I'll keep tech questions over if that section of the forum from now on too. 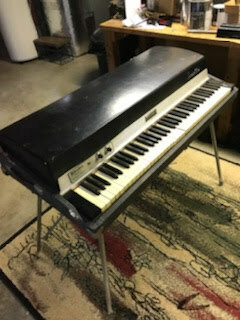 I picked up what I believe to be a 1975 Stage Mark I Rhodes a few months ago for a steal. Only catch was that it was in really rough shape. Always up for a challenge I've taken the last three months to restore it. There was obviously MUCH in between all this. I had to have a leg repaired at a local machine shop, replaced some broken bridle straps and one damper comb, screws and grommets, etc. etc. Still working on the voicing and will probably replace the hammer tips eventually. All told, it's been a joy to restore this old gal. 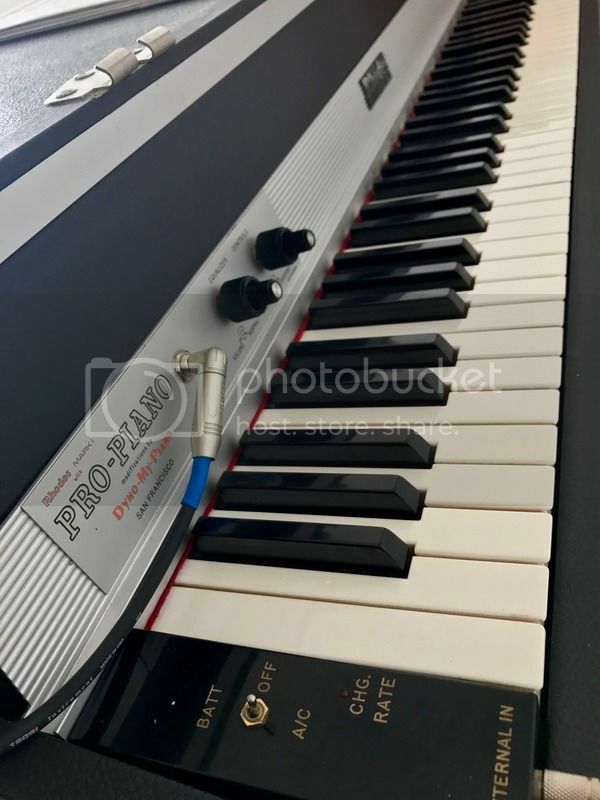 Hello - new to the Forum, but not to Rhodes ownership.. I'm the original owner of a 1979 Mk I Stage 73 Dyno Rhodes, recently tuned and regulated by Nir at FenderRhodesLA.com. Proud to say that Nir, rated my baby as a 9.5 out of 10, it's an AMAZING instrument, superb action, incredible range of sound, showing minimal signs of age! Please use a source other than photobucket. The pictures do not appear. Great job! Congratulations. I can tell you put a lot of love into it. Very much enjoyed your Flickr series on the restoration. How do you find the final results in terms of sound and play? Both are in good conditions. 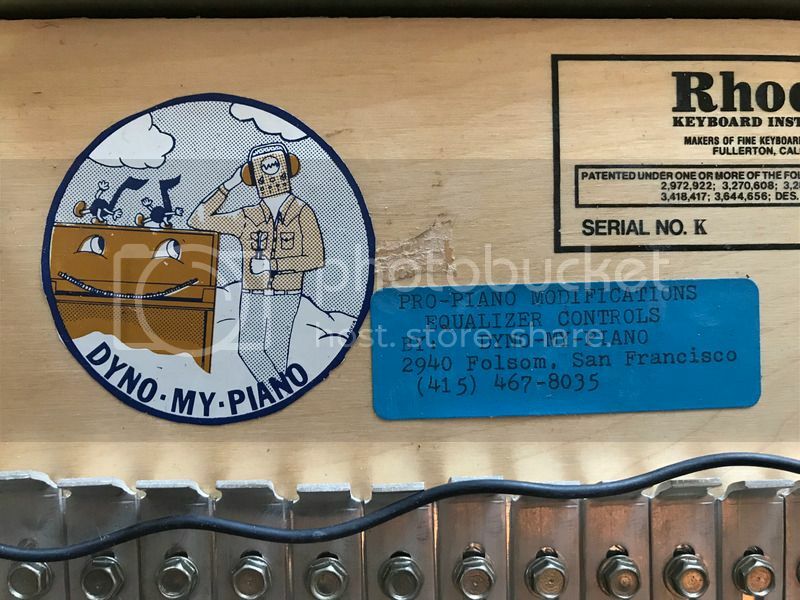 The Stage Piano from 1971 needs a fresh voicing. But the internals are in good shape. I use it with a TRamp; it's a tube preamp that is built with similar circuits like in a Fender Twin Reverb with an added stereo vibrato. Absolutely classic, with Peterson Preamp and the matching cabinet. Was fully restored by Doug (KlassicKeysGB) and it sounds absolutely wonderful. And yes, it's a perfect pair with a Minimoog. Nice looking pianos. Is that a Vintage Vibe sparkle harp cover, or did you do that yourself? It's not a vintage vibe harp cover. It's the original lid that i gave for custom painting job to a Switzerland-based drum manufacturer.